Members of Emory Students for Justice in Palentine (ESJP) hold a die-in protest at Wonderful Wednesday on April 3 as one of many events during Israeli Apartheid Week. Constitutional Council Chief Justice Matthew Ribel (19C) swears in incoming members of the 53rd Student Government Association (SGA) legislature on Monday, April 8. These new members will serve a one-year term. for DACA, but her sister, who is four years younger, was unable to qualify. By the time her sister reached 15 years old, the qualifying age for DACA, the Department of Homeland Security stopped accepting applicants. “Two years ago, we used to be able to sit down and talk about everything, but now all of our conversations boil down to why I have DACA and she doesn’t,” Kepa said. Kepa said the relationship with her younger brother is completely different from that of her sister. After Kepa’s brother was born, their mother returned to work, placing the burden of childcare on Kepa. Kepa’s brother would often look to her as a mother figure, Kepa said. “I remember vividly one day after the 2016 election when my mom and I were discussing a possible family separation and what would happen to my brother if we were to get deported,” Kepa said. “I had to sit [my brother] down … and explain that everyone but him in our immediate family had no secure status in the U.S.” For Matt Mach (18C), an undocumented immigrant from Poland, the threat of deportation became real for his family one year ago. Mach said he received a phone call from his mother who said two U.S. Immigration and Customs Enforcement agents had detained Mach’s father, who was eventually deported to Poland. His brothers and mother voluntarily moved back soon after. “My worst fear had been realized,” Mach said. Mach said he called dozens of law firms asking if they could provide legal assistance for his father’s case but none were willing to work without pay. Despite the treatment his family faced from the U.S. immigration system, Mach said he remains optimistic about telling his story and advocating for change. “[American immigration authorities] will not keep me from smiling, from thinking, from celebrating, from writing, from speaking, from loving and caring for my neighbors and they certainly won’t keep me from loving myself,” Mach said. “No matter how much they try, no matter the violence they inflict on us and our families, they will never take our humanity.” Associate Professor of Practice at the Business School Nikki Graves, who attended the event, said she was moved by the student speakers. “As a professor, this event and hearing these stories makes me even more dedicated to doing whatever I can to support these students who are such an asset in my classroom and at Emory,” Graves said. In January 2017, Emory announced it would not declare itself a “sanctuary campus” but would continue supporting undocumented students, the Wheel previously reported. next to Eagles for Israel when they held an event earlier in the week. Vice President of Eagles for Israel Melissa Harari (19B) said she was invited by an ESJP member to attend a lecture hosted by pro-Palestine group on Tuesday but was shunned when she invited their members to discuss the Israeli-Palestinian conflict with her. “I just broke down because it was so much to handle hearing their rhetoric and how they talk about Israel [and] … how they compare it to racist apartheid,” Harari said. “They don’t want to talk, and they frame themselves as the people starting the conversation.” Harari said she has no issue with the violations to campus flyer posting guidelines but said Emory should reform its free speech policies to prevent hurtful attitudes. In an email to students, Interim Vice President for Campus Life Paul Marthers said Campus Life is investigating the incident and has engaged with ESJP. which members would be allowed to run for an executive board position. If the amendments are approved, candidates who resign from executive board positions would be ineligible to be appointed again to some executive board positions, according to Gullatt and Richmond. Gullatt said one candidate planning to run in the election would have been impacted by the change but the executive board’s decision to propose the amendment was not meant to target the potential candidate. Gullatt and Richmond said they both checked with CC Adviser Sarah Beth Potter who said it was OK to pursue the amendment during the election cycle, as long as they followed their constitutional procedures. Potter did not respond to request for comment by publication time. Imani Brooks (20C), who is a friend of the affected candidate and previously served as BSA president, threatened to file a complaint with CC, according to Gullatt. Brooks declined to comment. Richmond, who will run to be the next BSA president, described CC’s intervention as confusing and unnecessary. “SGA or College Council has no formal relationship with the black community or BSA in particular, so I think the best people to evaluate candidates are the people involved in the organization,” Richmond said. “It’s, to an extent, an abuse of their power.” Richmond further takes issue with the anonymity of the complaints and how student government officials haven’t provided the organization with an opportunity to respond before suspending activities and freezing their financial accounts. “The cards are stacked against us, being black here at Emory,” Richmond said. “I’m not going to say it’s racially related, but also, why do they assume we don’t have the capacity or the capability to solve our own problems?” Editors’ Note: Albert Zhang previously served as an assistant news editor at the Wheel. He had no role in the composition or editing of this article. consults with the department and the employee is notified. The first incident prompted a twoweek investigation by the Office of Equity and Inclusion which resulted in Emory barring Zwier from teaching mandatory courses for first-year law students. They also required that he revise teaching manuals to include ways to address racially sensitive issues, participate in dialogues on racial sensitivity and complete sensitivity and unconscious bias training. The Black Law Students Association (BLSA) and Student Bar Association (SBA) began a petition on Nov. 12 after the second alleged incident, requesting that the University remove Zwier and require that he participate in cultural competency and unconscious bias training. BLSA President Wrenica Archibald (16C, 19L) and SBA President Nicole ElMurr (19L) did not respond to the Wheel’s request for an interview. dating someone else. The complainant refused to answer and the subject eventually left. The complainant said she has previously asked the subject to stop contacting her and she eventually blocked his number. The case has been assigned to an investigator. On April 2 at 6:48 p.m., EPD responded to the Undergraduate Residential Center Building D in reference to a theft. The complainant, an Emory student, said she left her apartment at 11:30 a.m. on April 2 and returned at 6 p.m. to find her Apple MacBook Pro, Apple iPad, Apple Pencil and Beats headphones missing from her bedroom. The complainant was unsure if the front door was locked as she shares the apartment with three other roommates. The officer spoke with one of the roommates who said she was not missing anything from her room. The other roommates were not at the location when the officers arrived. There were no signs of forced entry. The total value of the missing items is $2,115. The case has been assigned to an investigator. On April 3 at 7:33 a.m., EPD responded to the Robert W. Woodruff Library in reference to a theft. The complainant, an Emory student, said he was in the Matheson Reading Room earlier that day. At 4:30 a.m., he went to the first floor to take a nap and left his Apple MacBook Pro and other property in the Reading Room. When he returned at 6:50 a.m., he discovered his laptop missing. The complainant said the Reading Room was empty when he left. The laptop is valued at $1,000. The case has been assigned to an investigator. On April 3 at 9:31 p.m., EPD spoke with an EUH employee in reference to damage to his white 2014 Toyota Tundra. The complainant said he parked on the third level of the Lowergate East Parking Deck at 6:30 a.m. When he returned to his vehicle at 7 p.m., he noticed a note on his front driver side window that read, “Your parking is atrocious. Maybe invest in a smaller car. Have a great day.” When the complainant got home, he noticed a small dent on the rear driver side fender. The case has been assigned to an investigator. The Emory Wheel Volume 100, Number 23 © 2019 The Emory Wheel Alumni Memorial University Center, Room 401 630 Means Drive, Atlanta, GA, 30322 Business (404) 727-6178 Editors-in-Chief Nicole Sadek and Niraj Naik nwsadek@emory.edu and nhnaik@emory.edu Founded in 1919, The Emory Wheel is the financially and editorially independent, student-run newspaper of Emory University in Atlanta. The Wheel is a member publication of Media Council, Emory’s organization of student publications. The Wheel reserves the rights to all content as it appears in these pages, and permission to reproduce material must be granted by the editor-in-chief. The Wheel is printed every Wednesday during the academic year, except during University holidays and scheduled publication intermissions. A single copy of the Wheel is free of charge. To purchase additional copies, please call (404) 727-6178. The statements and opinions expressed in the Wheel are those of the authors and do not necessarily reflect those of the Wheel Editorial Board or of Emory University, its faculty, staff or administration. The Wheel is also available online at www.emorywheel.com. • In last week’s issue, “SAAC Discontinues Single-Visit Passes” incorrectly states that SAAC members may sponsor guests for free. In fact, guest passes cost $10. • On page 2 of last week’s issue, Tanika Deuskar was credited for the photo in “SGA Finalizes 32 Percernt Cuts to Media Council.” In fact, Ayushi Agarwal should be credited for the photo. 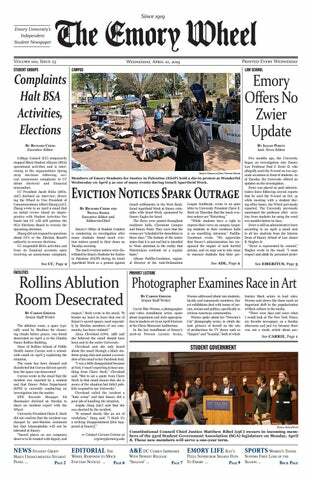 • On page 5 of last week’s issue, Anthony Wong’s op-ed stated that Emory Hillel confirmed that no Jewish students were targeted by the flyers. In fact, Emory Hillel said that there is no evidence that Jewish students were targeted. In Response to Protest Flyers After Emory Students for Justice in Palestine posted mock eviction notices on student doors on April 2, the Wheel recieved several responses from the Emory community. The following op-eds represent the views of those contributors. The Wheel Editorial Board’s response can be found on page 6. Wednesday, April 10, 2019 | Opinion Editor: Madeline Lutwyche (madeline.lutwyche@emory.edu) Asst. Opinion Editor Zach Ball (21C) previously served as president of Emory Students for Justice in Palestine and was not involved in editing these op-eds. if these flyers were placed only on the doors of Jewish students, but according to both ESJP and Dave Cohn, the director of Emory Hillel, they were not, the latter writing, “There has been no evidence that Jewish students were specifically targeted in the distribution of these flyers,” in an April 2 email. Investigations are ongoing, but so far, no red flags have been raised by Emory’s Office of Student Conduct. The other claims on these flyers were more or less the same — if not simple, verifiable facts, then mainstream opinions of legal scholars, like the assertion that such demolitions violate Article 53 of the Geneva Conventions and that Israeli settlements are illegal under international law. Are these claims controversial? Absolutely. Are there mainstream scholars on both sides of the issue? Yes. citizens. To assert that a provocative protest about these issues constitutes an attack on one’s community is a deplorable way to claim victim status and abdicate responsibility from having to answer for the actions of the State of Israel — the place that so many of the counter-protestors claim to love so dearly. How many past and current Emory students have casually bemoaned the hypersensitivity of students of color, dismissing them as snowflakes for expressing discontent with the culture at Emory? How many of these same students have now rallied behind Emory Hillel and the Anti-Defamation League, the latter whose director called the protests “offensive and intimidating”? In an April 2 Emory Hillel email, Cohn wrote that Hillel spent the day “wrangling with the challenges posed by such an action … defending the safety of our students from this intrusion on their privacy and security.” The letter closes reading, “in solidarity.” In solidarity? A threat to safety and security? Take a step back for a minute. If you had read that statement out of context, you would think that someone had just painted swastikas on the doors of Emory Hillel. The flyers were distributed to criticize the alleged human rights violations of foreign government. If something this anodyne makes you feel unsafe, you are not fostering a community dedicated to free inquiry and debate, the two values that ought to be most important on our college campus. But treating these flyers as if they constitute some threat to the safety and wellbeing of thousands of Emory students sure is a convenient way of sidestepping an actual conversation about complex issues. These are discussions we need to have, but for that to happen, we must make a collective decision not to treat every provocative attack on Israeli policy — especially those devoid of any semblance of bigotry — as if it is anti-Semitic. University President Claire E. Sterk wrote in a statement, “I’m confident we will balance the need to protect free speech and the security and dignity of all in our community.” In the case at hand, the only way to balance these competing interests that leaves Emory with any claim to “upholding free speech and vigorous debate” is to encourage ESJP to continue their protests in whatever civil, nonviolent way they intend to pursue them. There was no attack on the Jewish community by ESJP, but there was an attack on the virtue of open dialogue by various members of the Emory community. Grant Osborn (19C) is from Springfield, Ohio. Pro-Peace, Pro-Israel, Pro-Palestine Voice Exists These feelings are not contradictory; they are from a pro-peace, proNaomi Keusch Baker two state solution perspective. I do my best to recognize the nuances of the Being pro-Israel and anti-occupa- conflict and admit when I lack knowltion are not contradicting views: In edge. I’m not an expert on the complex order for Israel to be a democracy, history of the multiple groups of peoIsraeli occupation of the Gaza Strip, ples involved. I am not sure politically the Golan Heights, the West Bank and what a two-state solution would look East Jerusalem must end. like, but I firmly reject the alternative I have felt very alone at Emory on extremes. I believe that Palestinians the Israeli-Palestinian conflict, espe- and Jews both deserve a homeland and cially this week. I don’t feel welcome that the Israeli government is violatby the Zionist organizations, including ing human rights and breaking Israeli Emory-Israel Public Affairs Committee law. Simultaneously, the Palestinian and Emory Eagles for Israel, and I Authority also violates human rights. don’t feel welcome by Emory Students I believe that for a Jewish, democratic for Justice in Palestine (ESJP). state to exist, a Palestinian, democratic The National Students for Justice in state must also exist. Palestine organization’s rhetoric can be I am pro-Israel and openly criticize anti-Jewish, as they have used phrases the Israeli government, recognizing like “a cycle of Jewish supremacy” and that the government is not represent“[an] apathetic plea to protect Jewish ing the best interests of its people. students” in their online newsletters. I am pro-Palestine but criticize the J Street is a national organization Palestinian authority, acknowledgthat self-describes ing there are human as “pro-Israel, prorights violations. peace” and advocates If one needs a comI believe that for a for a two-state soluparison, I am proJewish, democratic United States, even tion. Other campuses have strong chapters though I protest the state to exist, that regularly chalcurrent American a Palestinian, lenge unconditional government and allegiance for and democratic state must many of the systems against Israel. Why in place. I still hope also exist. doesn’t Emory? for the success of It seems there American democracy is no space at Emory for pro-Israel, and still believe everyone who lives pro-Palestine, pro-peace conversa- here or wants to live here should be tions. Instead, we have a shameful able to peacefully. lack of dialogue between two polarOne must remember that Israeli, ized groups and a multitude of peo- Palestinian and people of many more ple who claim to be invested in the ethnic and racial identities live in this Israeli-Palestinian population without region of conflict. People live and work listening to what people who live there there every day, and the involvement of actually want.Israeli Prime Minister the U.S. in their conflict is something Benjamin Netanyahu may be the lead- I struggle with often. I often disagree er of Israel, but his government is not with American interference in other what most people in Israel believe in. countries, but I also believe in transnaI have family in Israel who are tional defense of human rights. anti-occupation and pro-Palestinian Education and research are crucial, human rights. and it hurts me that so many students Many individuals of diverse back- don’t see the value in engaging in diagrounds, including Israelis and logue with an open mind, especially Palestinians, Jews, Muslims and on the Israeli-Palestinian conflict. It Christians, living in Israel and the bothers me that now as the Israel and occupied territories want peace. Many Israel Apartheid Weeks are coming to want a two-state solution. an end, the conversation will dissipate. I reject Emory Eagles for Israel’s I was born in Ramat Gan, Israel, choice to ignore the occupation and and have been back to Israel on mulIsraeli violence, and I reject Students tiple occasions. The situation is far for Justice in Palestine’s choice to more complicated than is insinuated ignore Palestinian violence. by many students and organizations. I I reject the claim that the atroci- am Jewish and Israeli and American, ties in this that of the world should be but first and foremost I believe in compared to “those of Nazi Germany’s human rights. I openly criticize Israel Jewish ghettos,” as cited in Anthony and Palestine and openly support the Wong’s (21C) op-ed. peaceful success of both. I reject the claim that American Jews should unquestionably support Naomi Keusch Baker (20C) is from the Israeli government. Forest Hills, N.Y.
Israelis, using the two terms interchangeably. To place a burden on all Jews for the repressive policies of the right-wing Israeli government is to do the same to all Muslims for the homophobic and anti-feminist policies of Saudi Arabia. supporting the idea that Israel is an apartheid state. While no one can deny that dialogue has been created this past week, these counterproductive acts only expand divisions between those with differing views and do not advance their stated cause. Perhaps instead of performing these acts, calling for a boycott of Emory Hillel and Chabad at Emory and hosting anti-Zionists at Emory, ESJP could engage with pro-Israel students. In the words of Israeli military leader and politician Moshe Dayan, “If you want to make peace, you don’t talk to your friends. You talk to your enemies.” There is victimization on all sides of the conflict, and there is no need to provide further fuel to the fire. As a participant in one of the Emory Office of Spiritual and Religious Life Journeys of Reconciliation inter-religious trips that explored the IsraeliPalestinian conflict, I am familiar with the recognition of mutual humanity that is required for discussing these difficult issues. This type of acknowledgement is lacking in the actions of some who want to advance the Palestinian cause at Emory. Productive dialogue and engagement is necessary at this University, but we cannot reach that point until attitudes change to allow mature discussion. Alexander Wein (08Ox, 10C, 18G, 20M) is from Dalton, Ga. Careful Language Key To Effective Criticism the lines between what is anti-Israel and what is anti-Semitic, so caution and clarity are urged. If, on the other hand, Wong meant to refer to Emory’s I fully support protests against the “pro-Israel community,” I’d suggest the unjust demolition of Palestinian vil- need for clarification there, too. Recent lagest, but Anthony Wong’s (21C) op-ed numbers show that most U.S. Jews contains two notable consider themselves flaws that undermine not simply pro-Israel his argument. but also anti-settleRecent numbers First, the compariment expansion, antishow that most son of Israel to Nazi occupation and supGermany reflects portive of a two-state U.S. Jews consider some combination solution to the Israelithemselves ... antiof gross insensitivPalestinian conity, lack of proper settlement expansion, flict. The American editorial discretion anti-occupation and Israel Public Affairs and immaturity. It is supportive of a two- Committee (AIPAC) patently offensive to has also condemned state solution. the memory of Jews Israel Prime Minister who perished in the Benjamin Netanyahu’s Holocaust. Second, I decision to join with question the use of the word “Israeli” the Kahanist party, calling the party in this sentence: “If the Israeli commu- extremist and racist. nity at Emory genuinely supports free“Pro-Israel” should not be used as a dom of speech and individual safety, proxy for those who defend the Israeli they need to be self-reflexive and open occupation, much less the unjust to conversations about Israel’s treat- demolition of Palestinian villages. ment of Palestinians.” These errors in judgment and lanSince there are very few Israeli stu- guage call for a correction and apology dents at Emory, I suspect that Wong from both Wong and the editors of the meant to refer to Emory’s Jewish com- Wheel. munity in what is a typical conflation of “Jewish” and “Israeli.” This mixing Jonathan Kopp (88C) is a former of terms is the sort of sloppy language member of the Emory College Alumni that can quickly lead to a blurring of Board. Jewish leaders in our city. The students who posted these flyers do not need to be punished. They need to be brought into a conversation that they clearly feel left out of. Jews on this campus, in this city and across this country should look at this protest as a cry for help: If students advocating for Palestine feel that they must resort to shock-value protest tactics to get their point across, it is clear that they do not have enough forums to openly engage with those they disagree with. The Jewish community’s response threatens to further undermine a situation that is already laced with divisiveness and petty name-calling. There is one part that Wong is right about in his op-ed’s conclusion: Emory undoubtedly holds free speech in high regard. While the University should continue to be an incubator of free speech, it must also, as Rotenberg points out, be “a laboratory of ideas, where the freeflow of ideas builds the next generation of critical thinkers and leaders of a free society.” Emory can only foster inclusive and engaged dialogue on this controversial issue when it has buy-in from all sides. Even though ESJP hosted multiple discussion events aimed at addressing its concerns about the Palestinians’ living conditions, their distribution of the flyers overshadowed those attempts to foster conversation and tainted their reputation with provocative rhetoric. The group’s efforts undermined the opportunity to build bridges by implying, through its seemingly random distribution of phony eviction notices, that students who disagree with them are unwilling to debate like mature young adults. Its flyers were a waste of paper, and Wong’s op-ed, though perhaps well-meaning, flouted the nuance of this debate; he mistook the rejection of open dialogue’s potential for the constructive, honest conversation that this controversy desperately needs. Jake Busch (22C) is from Brookhaven, Ga.
Eagles for Israel published a statement decrying ESJP’s actions, writing that they were saddened by attempts to “provoke and intimidate Pro-Israel students.” The statement conflates anti-Semitism with criticism of Israel’s government. Such declarations delegitimize atrocious, veritable acts of anti-Semitism. Emory-Israel Public Affairs Committee’s statement that the eviction notices brought “psychological harm” and were “unwarranted, emotionally-damaging invasions of property” dramatizes the event and attacks students’ right to controversial free speech. ESJP’s actions were politically motivated, and SJP is a national organization supported by American Muslims for Palestine, which advocates for pro-Palestine legislation including the Boycott, Divestment and Sanctions movement against Israel’s government. It is important to recognize that ESJP is a political group, and their actions were part of a political protest. ESJP, as well as other groups on campus, have a right to political protest. Groups and individuals who criticize them must understand that fact in order to properly confront such protests. What’s more disappointing is that the Emory community allowed itself to be manipulated by outside organizations and individuals with personal agendas. Right-wing media outlets such as the New York Post misreported a rumor that the eviction notices targeted Jewish students. Washington Examiner Executive Editor Seth Mandel shared a tweet claiming that Emory students with a mezuzah, a Jewish symbol, on their doors had woken up to the eviction notices. This tweet misrepresented the fact that students had received notices regardless of their religious affiliation. Some Jewish organizations sensationalized the alleged anti-Semitism of the eviction flyers instead of engaging in thoughtful dialogue. The regional director of the Anti-Defamation League Southeast said that “Emory’s response minimized the true harm of the violation” on April 5, calling the flyers anti-Semitic. Since there is no evidence that the notes were targeted, and the flyers only contained criticism of a foreign government, such claims are unfounded and have given extremism a foot-hold within the Emory community. The opportunistic reactions of partisan media organizations have rallied opposition to students’ right to free speech and protest. Emory must publicly extend the same support it offered students first affected by the notices to ESJP students currently facing harassment. The overreaction to the flyers by both the Emory community and outside organizations minimizes actual anti-Semitic hate crimes. ESJP’s flyer protest, though lacking in tact, was an instance of free speech and an effective protest. It was not an anti-Semitic hate crime. Emory students must be more mature if they wish to legitimately discuss complex international affairs. Students have overlooked the fact that opinions regarding IsraeliPalestinian relations have routinely inflamed the Emory campus in recent years. It would be foolish to assume that similar events will not happen again. Emory students must learn to avoid the traps of misinformation and insularity for the University to become the exemplar of open dialogue it ought to be. The above editorials represents the majority opinion of the Wheel’s Editorial Board. The Editorial Board is composed of Zach Ball, Jacob Busch, Ryan Fan, Andrew Kliewer, Madeline Lutwyche, Boris Niyonzima, Omar Obregon-Cuebas, Shreya Pabbaraju, Madison Stephens and Kimia Tabatabaei. Zach Ball previously served as president of Emory Students for Justice in Palestine and recused himself from this peice. The Emory Wheel welcomes letters and op-ed submissions from the Emory community. Letters should be limited to 300 words and op-eds should be at least 500. Those selected may be shortened to fit allotted space or edited for grammar, punctuation and libelous content. Submissions reflect the opinions of individual writers and not of The Emory Wheel Editorial Board or Emory University. Send emails to michelle.ann.lou@emory.edu or postal mail to The Emory Wheel, Drawer W, Emory University, Atlanta, GA, 30322. Local artist Wiley from Atlanta performs at Couchella, an annual music festival organized by TableTalk Emory, on April 4.
ized it was futile to try to understand the placement of these works. Viewers may be disoriented by sudden shifts in the visuals, but that is a valuable part of the experience. When you first adjust to the soft swirls of Vincent Van Gogh’s “Entrance to the Public Gardens at Arles” or the demure dots of Claude Monet’s “Road to Vetheuil,” you immediately turn to see a wall of Paul Klee’s sharp, confusing lines. When you are able to see how these different artists and their styles work together allows you to see things about each painting that might have gone unnoticed if there wasn’t an opposite style directly next to it. Just as you think you’re settling into a style, the collection pulls you to another place and another time. attention. The film is packed with loving detail, showing us the penguin chicks’ scruffy down, the lithe twists of seals in water and the charmingly humanlike expressions on Steve’s face. It juxtaposes Helm’s casual narration of Steven’s life with the grandeur of the world around him, reminding us to search for that splendor in our own lives. It’s a happy film, first and foremost, balancing tension with clumsy penguin waddles, and dread with Steve’s lively humor. For its 76-minute runtime, “Penguins” makes the antarctic world feels closer to home, and the penguins closer to us. A procession of children conduct a funeral service in suburban Maine in the remake of popular horror novel, ‘Pet Sematary.’ third act when it races to the end credits without allowing certain moments and motivations to retain their intended effect. “Pet Sematary” simply neglects to develop its character’s relationships and personalities. This forces the audience to sympathize with the characters almost exclusively through their trauma, rather than through an actual connection and empathy toward the characters’ peril. Though film adaptations should stand alone from their source material — they are, after all, different mediums that require different executions. That being said, those who know and love the original story’s conclusion will likely be disappointed by the film’s conclusion. It’s effective enough as a fun night-out horror film, but, in conversation with the source material, it’s hard not to feel that something was lost in the adaptation process. At its core, “Pet Sematary” is a chilling examination of how a family chooses to deal with its grief. It offers a more refined form of the standard horror film that defined the late 2010s. “Pet Sematary” remains a seminal horror story whose resonant terrors are amplified by its effective directing and outstanding cast. And, to top it all off, it stars a murderous cat. tial sequel without detracting from the story. The climactic battle scene manages to showcase all of its strengths in a way that’s fresh and unpredictable. Overall, “Shazam!” is the most wellrounded DC movie thus far, fixing the flaws of its predecessors with a stellar blend of humor, character-building and stimulating plot. The DC haters will continue to hate, but with films like “Shazam!,” it’s becoming much harder to do so. with Â my Â hands.â&#x20AC;? But Â Whippleâ&#x20AC;&#x2122;s Â stint Â as Â a Â server Â and Â line Â cook Â was Â cut Â short Â when Â she Â began Â experiencing Â knee Â pains, Â which Â made Â it Â difficult Â for Â her Â to Â stand Â during Â her Â shift. Â Her Â work Â days Â were Â long, Â and Â Saturdays Â were Â especially Â draining, Â as Â she Â had Â to Â stand Â for Â more Â than Â her Â usual Â six-Â­hour Â shift. Â Still, Â Whipple Â didnâ&#x20AC;&#x2122;t Â want Â to Â leave Â Aramark. Â Instead, Â to Â ease Â the Â strain Â on Â her Â knees, Â she Â left Â the Â kitchen Â to Â become Â a Â cashier Â at Â Aramarkâ&#x20AC;&#x2122;s Â fac-Â­ ulty Â dining Â room. Â As Â a Â cashier, Â Whipple Â interacted Â with Â customers Â more Â consistently, Â and Â left Â a Â strong Â impression Â on Â the Â Emory Â community. Â Emory Â womenâ&#x20AC;&#x2122;s Â volley-Â­ ball Â Head Â Coach Â Jenny Â McDowell Â said Â Whippleâ&#x20AC;&#x2122;s Â positive Â persona Â brightened Â her Â dining Â experience Â at Â the Â faculty Â dining Â room. Â â&#x20AC;&#x153;She Â had Â this Â big Â smile Â on Â her Â face Â as Â you Â walked Â in,â&#x20AC;? Â McDowell Â said. Â â&#x20AC;&#x153;She Â may Â not Â have Â known Â you, Â but Â she Â always Â made Â you Â feel Â welcome. Â I Â always Â loved Â going Â [to Â the Â dining Â room], Â because Â she Â was Â always Â so Â nice Â to Â everybody. Â I Â just Â knew Â from Â day Â one Â how Â special Â she Â was.â&#x20AC;? Â Emory Â swimming Â and Â diving Â Head Â Coach Â Jon Â Howell Â shared Â a Â similar Â impression Â of Â Whipple. â&#x20AC;&#x153;I Â think Â sheâ&#x20AC;&#x2122;s Â my Â favorite Â person Â at Â Emory,â&#x20AC;? Â Howell Â said. Â â&#x20AC;&#x153;She Â puts Â a Â smile Â on Â everyoneâ&#x20AC;&#x2122;s Â face.â&#x20AC;? As Â the Â semester Â comes Â to Â an Â end, Â the Â sound Â of Â weeping Â students Â echoes Â across Â the Â seventh Â floor Â of Â the Â library. Â Their Â sultry Â song Â signifies Â the Â arrival Â of Â the Â dreaded Â finals Â season. Â Unfortunately, Â Doolino Â canâ&#x20AC;&#x2122;t Â publish Â the Â answers Â to Â your Â exams, Â but Â he Â can Â give Â us Â the Â answers Â to Â lifeâ&#x20AC;&#x2122;s Â great Â questions. Â From Â emotions, Â fashion Â and Â proverbs, Â Doolino Â answers Â all. dence, Â but Â the Â gesture Â made Â an Â impact. Â Downes Â and Â other Â WoodPEC Â staff Â held Â a Â meeting Â that Â week Â with Â Whipple Â about Â hiring Â her Â for Â the Â WoodPEC. Â The Â news Â came Â as Â a Â happy Â and Â emotional Â surprise Â to Â Whipple. 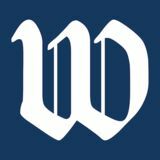 Â She Â was Â offered Â a Â 25-Â­hour Â workweek Â and Â remained Â on Â payroll Â so Â that Â she Â could Â work Â for Â the Â WoodPEC Â while Â she Â was Â laid Â off Â at Â Aramark Â during Â the Â 2012 Â summer. â&#x20AC;&#x153;We Â were Â all Â crying Â by Â the Â end Â [of Â the Â meeting],â&#x20AC;? Â Whipple Â said. Howell Â said Â he Â thought Â that Â Whipple Â would Â be Â a Â perfect Â fit Â for Â the Â WoodPEC, Â especially Â since Â she Â would Â be Â able Â to Â work Â consistent Â hours Â unlike Â many Â stu-Â­ dent Â attendants. Â â&#x20AC;&#x153;They Â have Â a Â hard Â time Â keeping Â consistent Â people Â at Â the Â [WoodPEC] Â desks,â&#x20AC;? Â Howell Â said. Â â&#x20AC;&#x153;Having Â someone Â who Â was Â an Â adult Â seemed Â like Â a Â fit. Â [Whipple Â is] Â positive Â and Â happy Â to Â see Â people. Â Communities Â need Â people Â like Â [Whipple].â&#x20AC;? Today, Â Whipple Â continues Â to Â express Â her Â gratitude Â for Â Howell Â and Â McDowell. to Â Atlanta Â to Â work Â in Â an Â Italian Â restaurant Â to Â attain Â a Â better Â life Â and Â make Â more Â money Â for Â his Â family. Â He Â said Â heâ&#x20AC;&#x2122;s Â stuck Â with Â the Â food Â industry Â because Â he Â enjoys Â the Â workflow Â and Â camaraderie. Â To Â this Â day, Â he Â still Â sends Â money Â back Â home Â to Â help Â his Â father Â with Â finances. When Â Delfino Â Cruz Â first Â came Â to Â the Â U.S., Â he Â knew Â no Â English. Â The Â language Â barrier Â definitely Â proved Â a Â struggle. â&#x20AC;&#x153;When Â you Â go Â to Â another Â country Â and Â donâ&#x20AC;&#x2122;t Â speak Â the Â language, Â everything Â is Â hard,â&#x20AC;? Â Delfino Â Cruz Â said. Â Over Â the Â weekend, Â when Â not Â working, Â Delfino Â Cruz Â spend Â his Â time Â relaxing. Â On Â Fridays, Â he Â loves Â to Â dance Â to Â country Â music Â and Â bowl. Â Over Â the Â years, Â heâ&#x20AC;&#x2122;s Â made Â tremendous Â strides Â in Â both, Â now Â averaging Â a Â score Â of Â 150 Â in Â Â bowling. Â On Â rare Â occasions, Â he Â splurges Â his Â leftover Â money Â on Â travel. Â His Â favorite Â destinations Â are Â Miami, Â Chicago Â and Â Las Â Vegas. Â He Â considers Â his Â home Â to Â be Â Atlanta, Â and Â he Â frequently Â visits Â his Â sister Â and Â her Â son, Â who Â live Â in Â Atlanta Â as Â well. Â Due Â to Â his Â demanding Â work Â schedule, Â he Â has Â not Â Â visited Â his Â father Â in Â Mexico Â since Â leaving Â the Â country Â 12 Â years Â ago Â â&#x20AC;&#x201D; Â something Â he Â hopes Â to Â do Â soon. Â â&#x20AC;&#x153;I Â miss Â my Â family Â sometimes,â&#x20AC;? Â Delfino Â Cruz Â said. Â â&#x20AC;&#x153;I Â miss Â my Â father.â&#x20AC;? Although Â he Â enjoys Â his Â current Â job, Â he Â d reams Â of Â someday Â b ecoming Â a Â f light Â attendant Â and Â traveling, Â hoping Â that Â his Â bilinguality Â better Â qualifies Â him Â for Â the Â job. Â Although Â he Â hasnâ&#x20AC;&#x2122;t Â t aken Â t he Â steps Â to Â do Â so, Â he Â has Â friends Â that Â work Â at Â Delta. Â He Â also Â dreams Â of Â buying Â a Â Â house Â and Â laying Â his Â roots Â close Â to Â Atlanta. Â Atlanta Â is Â the Â only Â place Â heâ&#x20AC;&#x2122;s Â lived Â in Â America, Â and Â he Â prefers Â to Â stay Â close Â to Â his Â sister Â and Â her Â son, Â his Â only Â family Â in Â the Â U.S. Â â&#x20AC;&#x153;There Â were Â a Â lot Â of Â challenges Â coming Â here, Â and Â I Â try Â to Â be Â a Â better Â person Â every Â day,â&#x20AC;? Â Delfino Â Cruz Â said. Â â&#x20AC;&#x153;I Â love Â working Â in Â restaurants Â but, Â one Â day, Â I Â want Â to Â do Â something Â different.â&#x20AC;? pressure Â off.â&#x20AC;? Whipple Â said Â she Â has Â no Â hard Â feel-Â­ ings Â for Â Aramark, Â though. Â She Â remains Â close Â with Â her Â former Â coworkers, Â many Â of Â whom Â still Â work Â at Â the Â DUC-Â­ling. Â Alongside Â these Â old Â bonds, Â Whipple Â has Â also Â formed Â lasting Â friendships Â with Â the Â WoodPECâ&#x20AC;&#x2122;s Â visitors. Â As Â she Â completes Â her Â 23rd Â year Â at Â Emory, Â Whipple Â has Â no Â plans Â to Â leave Â the Â WoodPEC. Â She Â spends Â her Â vaca-Â­ tion Â time Â well, Â enjoying Â Atlanta Â sum-Â­ mers Â with Â her Â two Â granddaughters. Â With Â another Â granddaughter Â on Â the Â way, Â Whipple Â said Â she Â is Â excited Â to Â wel-Â­ come Â the Â new Â addition Â to Â the Â family. Â In Â the Â meantime, Â sheâ&#x20AC;&#x2122;ll Â continue Â greet-Â­ ing Â a Â different Â kind Â of Â family Â at Â the Â WoodPEC. â&#x20AC;&#x153;It Â makes Â me Â feel Â good Â when Â I Â see Â [the Â students] Â and Â I Â call Â them Â my Â kids Â â&#x20AC;Ś Â all Â these Â people Â are Â my Â family,â&#x20AC;? Â Whipple Â said. Â â&#x20AC;&#x153;You Â should Â always Â give Â out Â posi-Â­ tivity Â â&#x20AC;Ś Â What Â you Â put Â out Â is Â what Â you Â get Â back.â&#x20AC;? Baseball Gaining Momentum Continued from Back Page “It was great to have rich back on the mound to sure up our weekend pitching rotation,” Greene said. “We feel great offensively and defensively.” With the series tied going into the final game, both teams came out ready to fight. The Eagles scored twice in the first inning off of rBIs by Brereton and Terp, but neither team was able to score again until the seventh inning. Sophomore pitcher Jack Moore’s impressive pitching performance held Huntingdon to just one run though seven innings. He struck out five batters and allowed only six hits and three walks. After Huntingdon cut the lead to one in the top of the seventh, Emory scored twice in the bottom when junior infielder ryan Adelman ran home after a wild pitch and Diamond stole home as part of a double steal. In the eighth inning, Huntingdon again cut the lead to one, but Emory scored once more to bring the lead back up to two. In the top of the ninth, Huntingdon scored twice to tie the game up before heading into the final half inning. Due to Huntingdon’s defensive errors, the Eagles put two players on base before Brereton was intentionally walked to fill the bases. Junior infielder Christopher Stern stepped up to the plate and delivered a walk-off to left field which brought in the winning run. Although Brereton was proud of his team, he acknowledged that there is still work to do. “We’re confident with where we’re at but not satisfied,” Brereton said. “We are looking forward to our midweek game [against Oglethorpe] on Tuesday, and then we’ll set our sights on a huge conference series against Case Western next weekend.” The game against Oglethorpe was rescheduled to Wednesday due to inclement weather. The Eagles will face Case Western reserve University (Ohio), a University Athletic Association foe, in their next game on April 12 at Chappell park. @ Birmingham-Southern 6 p.m. & 8 p.m.
@ Berry Field Day All Day New York University 2 p.m. & 4 p.m. Case Western Reserve 3 p.m.
@ Berry Field Day All Day Case Western Reserve12 p.m. & 3 p.m. New York University 1 p.m. & 3 p.m. @ Georgia St 2 p.m.
Harper Contract Worth Every Penny to Phillies Continued from Back Page after joining the phillies. Harper was met with a wave of boos from Nationals faithful in his first plate appearance, during which he struck out. Shortly after he was retired, Nationals fans showed their true colors and began to trickle out of the stadium every passing inning. It was clear that Harper occupied a tremendous amount of real estate in their heads, free of charge. They also showed that they are unwilling to see their team through the natural periods of success and failure that come with professional sports. They’d rather focus on booing an opposing player than cheering on their own team. front office decisions. The Nationals could be dominating the National League East right now with a stacked pitching rotation, solid positional players and, of course, Harper. But after years of disappointing postseason play, maybe they decided that they would rather let their best player walk, not make the playoffs and avoid the disappointment altogether. Meanwhile, my phillies are on a roll and their offense is a nightmare for opposing pitchers.pretty soon, we’ll be so far in first place that the Nationals will look like a dot all the way down at the bottom of the division. Get used to the cellar, Nats fans. ninth win of the season during the Eagles 13-3 victory. ryan won UA A Softball Hitter of the Week for her stellar performance this weekend. She hit .455 over the weekend, going five for 11 at the plate with eight rBIs and four runs. ryan is hitting .354 with 19 rBIs on the season. The Eagles’ 21-5 start to the season gives them an .808 winning percentage. This is ahead of their performance last season, when the team went 29-12 and .707. Though the team was able to make it to the playoffs last season, they’ll be looking to go on more than a one-game run this time. The Eagles will be back in action again on April 10 for a doubleheader at Birmingham-Southern College (Ala.). Members of the baseball team greet each other between innings during a game against Brandeis University (Mass. ), which was held at Chappell Park on March 30.
but Emory soon took the lead again when senior infielder NJ Kim stole third base and made it to home off of an ill-fated throw by Huntingdon’s catcher in the seventh. This was the final run Emory would score, and Huntingdon ended the game with five unanswered runs in the seventh and eighth innings to defeat the Eagles 8-4. The loss goes to freshman pitcher Jack Brodsky, who fell to 4-2 on the season. Junior pitcher richard Brereton said the loss fired them up for the following two games. “This weekend was huge for us,” Brereton said. “Although we didn’t get the win on Friday, we played a really competitive game, and [it] gave us great momentum for Saturday and Sunday.” In the second game of the series, the Eagles won by the mercy rule for the fourth time in seven games. Offensively, freshman infielder Zeke Diamond extended his team-high hitting streak to nine games with a threehit game. He also drove in three runs, scored twice and stole a base. Junior catcher Jacob Greene put his mark on the game by hitting two home runs, one of which was a grand slam in the top of the third inning. Greene went a perfect three-for-three at the plate and crossed home three times. Brereton had a dominant performance both offensively and defensively, going four-for-five at the plate with two doubles, three rBIs and two runs scored. Defensively, he threw five scoreless innings, striking out three and allowing only three hits to just one walk. Brereton earned the win and moved to 2-0 on the season. Greene thought Brereton’s performance was game-changing. B y a lex M oskoWitz Staff Writer The Emory softball team won three out of four games this weekend against the Washington University in St. Louis (Mo.) Bears to push their record to 21-5 in overall play and 7-1 in the University Athletic Association (UA A). Though the loss snapped the Eagles’ 11-game winning streak, the Eagles still tout an impressive record. While Emor y finished the weekend with a series win, the Eagles lost a nail-biting first game against the Bears 6-5. The Bears used a four-run fourth inning to break a 2-2 deadlock and raise the score to 6-2.
they’re not trying hard enough, then so be it. Facing an immense challenge, Harper did earn that respect in his introductory press conference, where he embraced the city of philadelphia more than any other athlete I have ever seen. He promised to help bring the phillies their first World Series since 2008 and talked about his decision to wear No. 3 on his jersey instead of No. 34, which he wore during his time with the Nationals. The gesture is a nod to the late roy Halladay, who wore 34 while he pitched for the phillies from 2010-13. Halladay passed away in a plane crash in 2017, a tragedy that was felt throughout philadelphia. Despite everything he said, Harper still had to prove that he was worth his contract after batting a disappointing .249 last season. And so far, he has. After going hitless in the first game of the season against the Atlanta Braves, Harper launched a 465-foot home run into the second deck in Citizens Bank park in the next game against Atlanta. He followed that home run up with two more in the next two games, one more against Atlanta and one against the Nationals in his first game in D.C.